Kbbreview, the leading trade publication for the KBB industry has released their Trends Special, forecasting what 2016 holds for the KBB industry and what the top trends will be this year. Their research has highlighted three key words to consider for kitchens in 2016; personalised, individual and bespoke, as consumers look to invest in a kitchen that is unique to them. Grey looks set to be the colour of the year again, albeit in deeper tones than 2015. Bold colours such as deep greens and blues will also be popular, together with accent finishes in bronze, zinc and copper. And with many more manufacturers offering a colour matching services, painted kitchens in particular will continue to grow in popularity. Flexibility is another key word used by kbbreview in their trend report. Dividing the room by zones within the open-plan setting is set to increase in popularity. This allows for a mix and match of styles, colours and materials, which again enables the homeowner to add a stamp of individuality. Unique free-flowing spaces will be created using freestanding units with visible feet or drawers with open tops providing a looser and freer feeling, and open shelving acting as room dividers to give each area its own identity. Curves will be introduced to the kitchen layout in the form of curved edges on island units, curved tall larder and s-shaped runs of units and drawers. 2016 will also be the year of ‘less is more’ in the kitchen, with appliances and sophisticated drawer configurations are being designed to be seen, but only when in use, and the rest of the time hidden behind sleek, electronic door systems. This look is continued into the work surface, as integral sinks remain popular with their smooth, virtually seamless look. 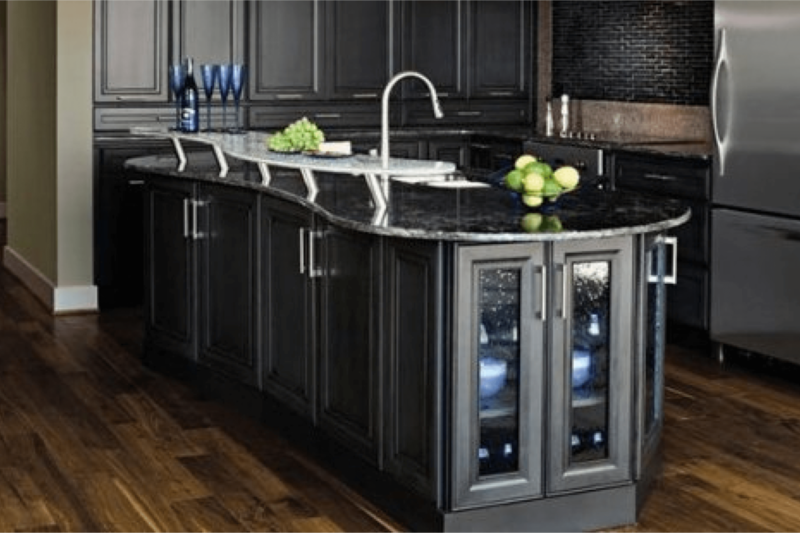 Hot water taps will continue to be a growth area for kitchens. As prices fall for four-way taps that offer instant hot, filtered cold and ordinary hot and cold water, these taps are no longer considered a luxury item and are becoming the norm in today’s kitchen. Lighting has been singled out as being set to have an exciting year in kitchens, as it finally becomes widely considered in the initial design of the kitchen, rather than being an afterthought. This runs in tandem with the expanding range of new technologies in home automation, which is set to impact on the kitchen, not just in 2016 but well into the future. Lighting controllers, remotely-operated appliances and entertainment systems will become more honed to consumer needs and requirements, and more widely accepted and understood by specifiers and installers. 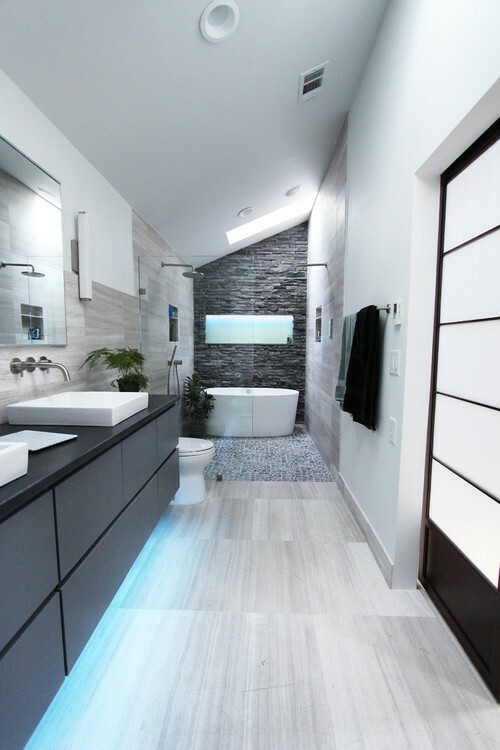 Contemporary Bathroom by Atlanta Kitchen & Bathroom Fitters Change Your Bathroom, Inc.
Like the kitchen market, the bathroom products market is set to grow, with a forecasted market size of £870 million by 2017, and an increase of around 18% since 2013. The increase in accessible bathroom products is being driven by the rise in multi-generational families alongside a growing over-65 population who demand products which are not only functional for the less-abled but are also well designed, simple to install and easy to clean. Technology in the bathroom is a growth area for 2016 as can be seen by the increase in smart showers, which can be controlled remotely or by touch-screen, and can stream music via the shower head. As with kitchens, there is a move towards bolder colours, with the darker greys being on-trend for 2016, alongside dark blues and greens. And if ISH 2015 was anything to go by, expect to see black making a strong appearance this year, alongside rose-gold metallic finishes. Again, following the lead from kitchens, soft curves and mixing materials such as timber with gloss finishes will be a strong trend for 2016, enabling homeowners to personalise their bathroom space with innovative combinations. Ceramic continues to dominate as the favoured material for sanitaryware, but new shapes with super-slim profiles are appearing thanks to developments in materials such as SaphirKeramik by Laufen which offers the same durability and ease of cleaning as ceramic, yet enables extra thin profiles for a very contemporary look. This, alongside a gradual shift towards more modern, wall mounted, free standing furniture with clever storage solutions, will enable the bathroom market accommodate the requirement for small spaces to feel spacious by clever use of products. With consumers becoming increasingly conscious of their water usage, concerns over the environment and the need to save water continues to drive product design, as manufacturers search for the holy grail of an attractive product which is user-friendly as well as green. Bathroom design in 2016 will continued to be influenced by boutique hotels and high-end spas, and the consumers’ requirement to replicate a similar look in their home. A coordinated look between the bedroom and bathroom has led many manufacturers to the develop furniture ranges which seamlessly link the two rooms. As the trend for smaller houses continues, space is paramount in the bedroom and this is driving sales of modular bedroom furniture incorporating clever storage solutions. The growth in sales of gloss slab-door ranges also follows this trend as consumers want to keep their bedrooms as light and bright as possible due to their smaller size. Smooth matt colours will also be a key trend for 2016, with wood grain finishes moving into the background as clad panelling or shelving elements. Children and teenagers’ bedrooms will be a key area for bedroom furniture, according to AMA Research which has highlighted reasonable levels of growth in this sector. This is thought to be a reflection of the changing use of children’s bedrooms, from a place for sleep only, to a place to sleep, work and play. The mix and match trend continues into the bedroom as designers are asked to create thick and thin elements for a luxurious look, for example thin worktops combined with thick shelving. 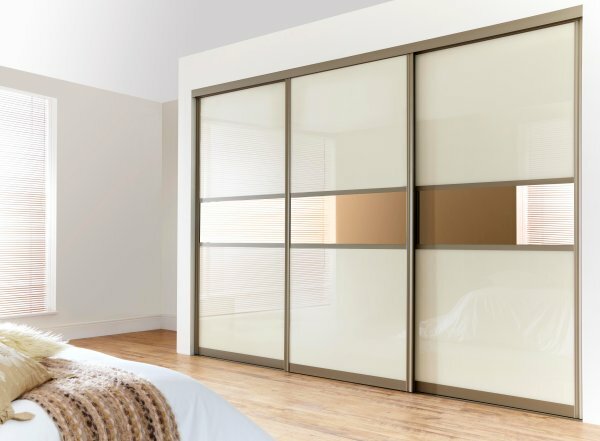 Sliding doors for fitted wardrobes are a key growth area. What used to only be considered for a smaller room is now the preferred option for all sizes of bedroom, with a wide selection of doors available to choose from. As a mature sector, the bedroom furniture market is expected to show slow, but steady growth over the next few years to reach a value of £653 million in 2018.